ww2dbaseWalter Heitz was born in Berlin, Germany and joined the military in 1898. He saw action in WW1 as a member of the 36th West Prussian Field Artillery Regiment, receiving the Iron Cross First Class and Second Class awards during the conflict. Between 1931 and 1936, he was the Commandant of Köningsberg in East Prussia, Germany, during which, in 1934, he was promoted to the rank of lieutenant general. A staunch supporter of the Nazi regime in Germany, he was appointed the President of the Supreme Military Court in Aug 1936, and held this position until 1939. 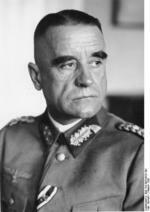 In Apr 1937, he was promoted to the rank of full general (General der Artillerie). When the European War began in Sep 1939 with the German invasion of Poland, although at the age of 61 he was eligible for retirement, he remained in service. In Sep 1939, he served as the Commandant of Danzig. In Oct 1939, he became the commanding officer of the VIII Corps, and in this capacity he participated in the invasion of the Low Countries and France. On 4 Sep 1940, he received the Knight's Cross of the Iron Cross award. At the helm of the VIII Corps, he also participated in the invasion of the Soviet Union, leading troops until he was captured at Stalingrad in southern Russia. He was known as one who obeyed Adolf Hitler's orders verbatim, and had threatened his men with arrest and execution should they attempt to fall back from Stalingrad against Hitler's orders. On 21 Dec 1942, he was awarded oak leaves to his Knight's Cross. On 30 Jan 1943, days before the Germans were defeated in Stalingrad, he was promoted to the rank of colonel general. On the following day, Field Marshal Friedrich Paulus surrendered the German troops at Stalingrad, and in turn Heitz was also captured. He was transferred to Moscow, Russia as a prisoner of war, and was uncooperative with his captors. He passed away from cancer before the end of the war in Moscow while still a prisoner of war and was buried in Krasnogorsk near Moscow. 8 Dec 1878 Walter Heitz was born. 9 Feb 1944 Walter Heitz passed away.